Is Ambien Rehab Aftercare Necessary? What is Ambien Rehab Aftercare? Because addiction to drugs such as Ambien (R) (zolpidem) is a chronic disease, behavioral changes and healthy lifestyle modifications will need to continue indefinitely to promote lasting recovery. We need to build on successes achieved in treatment, while removing the barriers which our addiction helped us build to protect us from others, from ourselves, and from life. This is what aftercare is all about. Aftercare continues the long-term treatment of Ambien addiction. It helps prevent relapse after periods of abstinence and provides crisis intervention in the event of a relapse. Treatment effects tend to decline when a patient leaves treatment; so aftercare can keep the momentum going, as it were. A study conducted in Los Angeles among addicted youth (ages 12-24) revealed that those who participated in mobile-based (cell phone) aftercare interventions were significantly less likely to relapse, experienced less substance problem severity, and were more likely to participate in extracurricular recovery programs than those in TAU (treatment as usual). Reseach indicates an increasing trend in the percentage of people abusing Ambien in the last decade. Furthermore, Ambien abuse may have a tolerance / withdrawal profile similar to heavy use of benzodiazepines (BZDs) such as alprazolam (Xanax (R)) or clonazepam (Klonopin (R)) - including carrying the risk for withdrawal seizure. If you, or someone you care about, needs help with their Ambien addiction or other type of drug abuse, you can call us at 1-888-993-3112Who Answers? for help in finding the right treatment program. Relapse prevention involves altering behavior so that high-risk situations are avoided, as well as learning how to respond when these situations are unavoidably encountered. Address his/her fears of relapse. Pay heed to the feedback received from peers. Learn the skills that are indispensable for maintaining a happy, drug-free life. Relapse can happen in the challenging early phase of recovery from addiction. Relapse prevention strategies can use brief lapses in recovery, and instances of returning to drug use as therapeutic tools, thus preventing full relapse to pre-treatment conditions. A general relapse prevention strategy recommended by Marlatt and Gordon (1985) and Prochaska and colleagues (1994) uses interventions which are matched to the client's stage of change. Change comes slowly, so strategies will target a stage of change--such as ambivalence about remaining abstinent--to then work through it with the recovering client. Then, as change continues, emphasis will shift to lifestyle modifications. Mindfulness-Based Relapse Prevention (MBRP) is one such treatment, which emphasizes non-judgment, acceptance, and awareness of one's condition. It has been defined as "the awareness that arises through paying attention on purpose, and in the present moment, to the unfolding of experience". Research has revealed lowered levels of craving following treatment with MBRP compared to TAU (treatment as usual). Like other chronic diseases--such as diabetes, hypertension, COPD, and some autoimmune conditions--drug addiction is a chronic and long-lasting disease, treatable with continuing care and behavioral change. The rate of relapse for drug addiction (40-60%) in a 2000 study was below that for asthma and hypertension (both at 50-70%). Like the diabetic who relapses because of a lapse in strict dietary control, the drug addict may have occasional relapses despite efforts to remain abstinent. This is to be expected and can be used to intensify other aftercare components such as counseling. It takes time to find the right treatment protocol for chronic disease, and addiction is no exception. Be patient and--beyond the motivation and open-mindedness essential to recovery--be gentle with yourself. No one chooses to be addicted to drugs, but you can choose treatment which will help to build a future of recovery. Go ahead and call one of our specialists at 1-888-993-3112Who Answers?, who will listen to you, and help you find the treatment which is right for you. 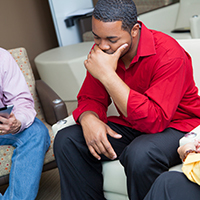 Most continuing care/aftercare programs consist of weekly or monthly counseling, outpatient support groups, and participation in supportive 12-Step programs such as Narcotics Anonymous (NA). Since the mechanism of action for Ambien is similar to that of benzodiazepines (BZDs), individuals addicted to Ambien will most likely benefit from the counseling interventions used for BZDs. A systematic review of the counseling intervention studies on BZD treatment examines a number of different interventions, including Cognitive Behavioral Therapy (CBT), Motivational Interviewing (MI), relaxation studies, and letters to patients from their primary care physicians advising them to reduce or quit the drugs. Research suggests that the most effective treatment is CBT with a taper (gradual dosing down) of the drug in the short-term (3-month time period). Relaxation therapy--as a behavioral intervention for those abusing "sleeping pills"--uses a number of techniques which include the power of suggestion (e.g. repetition of the mental directive "I feel my body gently floating on a calm river"), quieting the mind in a peaceful setting. Breathing exercises may also be employed to good effect. Some studies have demonstrated that relaxation therapy helped chronic users of sedative-hypnotics like Ambien to reduce or eliminate their use. Group Counseling uses the resources and experiences of the small group of addicts to help each other face the denial about their addiction, confront their unpleasant feelings about their addiction, and to mutually share the struggles of life without drugs. Group counseling helps to instill hope in individuals by reaffirming the fact that no human deed or thought is outside the experience of others. Individual Counseling has the advantage of allowing the therapist to deal with issues particular to the client as they arise. It helps to build a relationship of trust when sharing deeply personal issues that the individual is not ready to be share in a group setting. Stressing spirituality and reliance on a Higher Power/God to help in recovery, 12-Step programs are part of the aftercare of many addicted individuals. Narcotics Anonymous (NA) programs support the individual's efforts to become and remain drug-free. They offer a social support network of people who do not use drugs. While, in isolation, they do not comprise comprehensive drug abuse treatment, they do provide additional support in aftercare, with attendance at such programs associated with better abstinence outcomes. Twelve-Step NA Caduceus Groups are available for healthcare professionals, a population in which there is reported high incidence of Ambien addiction, especially among those working long shifts, such as medical residents. There is no specific medication to help with cravings for Ambien or BZDs after treatment. Flumazenil has shown some effectiveness in treating withdrawal from Ambien, and the development of a longer-acting (several weeks) flumazenil formulation has been explored. In a study of patients who took Ambien for stimulation and anxiolysis ("feeling good on Ambien"), fluoxetine was effective in helping to discontinue use. Alternative treatments for insomnia may be needed as part of medical follow-up. Sober Living Communities include halfway houses, and other living accommodations that receive patients from inpatient or detox programs who are not ready for independent living, and/or those who need the support of an environment conducive to recovery. Motivation for treatment, prior involvement in self-help, and social resources (e.g. involvement of family/friends) predict engagement and positive outcomes. Studies find that, as part of these living arrangements, life skills training, 12-Step groups, and enhancement of supportive relationships make for healthier coping strategies and decreased drug use. Therapeutic communities are designed to serve the addict who needs the greatest attention with rehabilitation, or needs to learn a positive lifestyle for the first time. Studies demonstrate reductions in drug use and criminality, with increases in employment and prosocial behaviors. Contingency Management (CM) is defined as the positive reinforcement of desirable behaviors, specifically negative drug screens, during treatment. Vouchers, which have varying degrees of retail value, are awarded for abstinence, objectively measured by urinalysis screening. Its success is likely due to the fact that it offers a concrete and immediate alternative to the Ambien or other drugs, gradually strengthening the deliberative processes ("thinking through") in the brain. Research studies for BZD dependence show that CM is highly effective in reducing use of anxiolytic/hypnotic drugs such as Ambien, with a statistically significant effect evident in BZD-free urine specimens. In a cohort of methadone clients who also used diazepam (Valium (R)), a reward of 1 take-home methadone dose was offered to those who refused to request diazepam. At baseline (beginning of the study) 95% of the methadone clients requested diazepam. When the methadone take-home privilege was offered, only 11.2% of diazepam doses were requested. CM with combined Cognitive Behavioral Therapy (CBT) and Motivational Enhancement Therapy (MET) has yielded significant retention in treatment, with continued MET and CBT helping sustain abstinence in young adults referred by the criminal justice system. No matter how much alienation there is in a family affected by addiction, they are critical to the strength and duration of a client's recovery. Their attitudes, function, and structure have been shown to be the most important variables in an addict's recovery. The friends and family can confront the addict and support him/her, while learning to see how addiction has affected other patterns of family life. Family therapy provides a safe place to tackle lifestyle changes needed. It helps the individual struggling with addiction to change through appropriate confrontation and feedback, and it helps the family to find their appropriate and secure place in the family system. Carroll, K.M., et al. (2006). The Use of Contingency Management and Motivational/Skills-Building Therapy to Treat Young Adults with Marijuana Dependence. J Consult Clin Psychol 74(5):955-66. Darker et al. (2015). Psychosocial Interventions for Benzodiazepine Harmful Use, Abuse, or Dependence. Cochrane Database Syst Rev 11;5: CD009652. Giblin, M.J., and Clift, A.D. (1983). Sleep Without Drugs. J R Coll Gen Pract 33(255): 628-33. Gonzales, R. et al. (2014). Substance Use Recovery Outcomes among a Cohort of Youth Participating in a Mobile-Based Texting Aftercare Pilot Program. J Subst Abuse Treat 47(1):20-26. Hood, S.D., et al. (2014). Benzodiazepine Dependence and Its Treatment with Flumazenil. Br J Clin Pharmacol 77(2):285-294. James, R.K. (2008). Crisis Intervention Strategies. Sixth Edition. Belmont, CA: Brooks/Cole. Kabat-Zinn, J. (2003). Mindfulness-Based Interventions in Context: Past, Present, and Future. Clinical Psychology:Science and Practice 10:144-156. Kenna G.A., et al. (2012). Substance Use Disorders in Health Care Professionals. In Johnson, B.A., editor. Addiction Medicine. New York, NY: Springer. Keuroghlian, A.S. et al. (2012). Circadian Dysregulation, Zolpidem Dependence, and Withdrawal Seizure in a Resident Physician Performing Shift Work. Am J Addict 21(6):576-7. Liappas, (2003). Three Cases of Zolpidem Dependence Treated with Fluoxetine: The Serotonin Hypothesis. World J Biol Psychiatry 4(2):93-6. McLellan, A.T., et al. (2000). Drug Dependence, A Chronic Medical Illness: Implications for Treatment, Insurance, and Outcomes Evaluation. JAMA, 284(13):1689-1695. McKay, J.R. (2001). Effectiveness of Continuing Care Interventions for Substance Abusers: Implications for the Study of Lont-Term Treatment Effects. Evaluation Review 25(2):211-232. NAADAC, (2009). Basics of Addiction Counseling: Desk Reference and Study Guide. Alexandria, VA: NAADAC. Ritvo, J.L., and Causey, H.L. (2008). Community-Based Treatment. In Gallanter, M., and Kleber H.D., editors. The American Psychiatric Publishing Textbook of Substance Abuse Treatment. Washington, DC: American Psychiatric Publishing, Inc.
Stitzer, M.L. et al. (1982). Contingent Reinforcement for Benzodiazepine-Free Urines: Evaluation of a Drug Abuse Treatment Intervention. Journal of Applied Behavior Analysis 15:493-503. Stitzer, M.L., Bigelow, G.E., and Liebson, I. (1979). Reducing Benzodiazepine Self-Administration with Contingent Reinforcement. Addict Behavior 4(3):245-252. Substance Abuse and Mental Health Services Administration (SAMHSA). TIP 47. Substance Abuse: Clinical Issues in Outpatient Treatment. Rockville, MD: SAMHSA. Victorri-Vigneau, C., et al. (2014). An Update on Zolpidem Use and Dependence. Journal of Addictive Diseases 33:15-23. Wietkiewitz, K. et al. (2013). Mindfulness-Based Relapse Prevention for Substance Craving. Addict Behav 38(2):1563-1571.